Due to the steady increase of substance abuse and addiction within the United States, researchers and policy makers are determining ways to understand the prevalence of drugs by geographic location. In doing this, they can better tailor their approach to counteracting the struggle with illegal substances in that particular area. Following the example set by European researchers, the United States has begun a new process, sewer epidemiology. Although unusual, this innovative type of experiment is greatly aiding the experts with the knowledge necessary to reduce substance abuse and addiction. Recently, to identify these specific areas, researchers have been conducting rather unorthodox experiments to find where these illegal substances are most being abused. European researchers conducted lab tests on sewage water in 42 major European cities to determine drug use in each of their locales. The experiment was able to test for a variety of drugs, ranging from marijuana and cocaine to ecstasy and heroin. These are being performed in all corners of the world from the United States to Europe. An article from Popular Science stated that the experiment was supported by a variety of government agencies, universities and prevention organizations. Many of the cities’ tests revealed alarmingly high levels of cannabis, cocaine, MDMA, meth and other assorted amphetamines. From this, researchers could also determine when substances were being abused, whether it be during the week or the weekend. This wastewater analysis has been the largest yet conducted and exposes a new perspective on regional drug abuse in Europe as well as user behavior. Although unusual, this innovative type of experiment is greatly aiding the experts with the knowledge necessary to reduce substance abuse and addiction. When individuals take drugs, they will eventually be excreted into water. Sometimes these substances are still intact, or they can be broken down into specific metabolites. Due to modern day technology, water can be tested to gauge how much substance abuse is occurring in a specific area. Before this research was conducted, known as “sewage epidemiology,” substance usage was generally estimated by surveys and crime statistics. Now researchers can better gauge the amount of the population using these substances. Researchers hope that by identifying the substances and where higher usage rates are, they can combat addiction. This approach, originally coined in London, has spread across Europe and now to the United States. An article by Bloomberg explains that over the past three years, researchers have analyzed multiple cities’ wastewater. 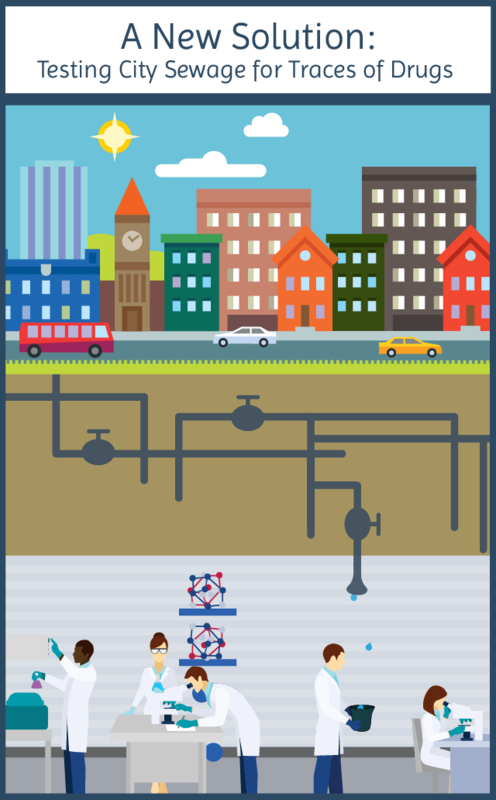 The researchers have analyzed wastewater from over 20 million people living in 42 cities and 21 countries. They tested for metabolites that the body produces after ingesting a variety of drugs. Over a weekly period, samples were acquired every day, allowing for researchers to directly understand certain days when drug use was most prevalent. Researchers use a process called back-calculation to make these determinations. 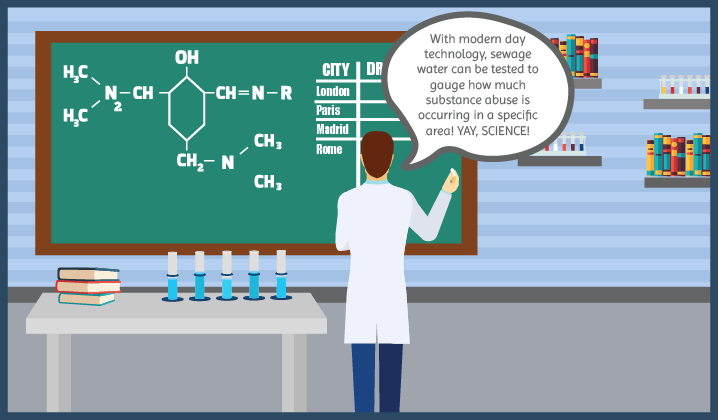 Back-calculation is where researchers can analyze and calculate the amount of substances taken by a population based on what is found from sewage waters.From these types of studies, researchers can disseminate this information and organizations can better understand how to combat substance abuse and addiction. This approach quickly made its away across the world and to the United States.Bloomberg also states that, for example, in 2008 this type of study was conducted in 96 municipalities in Oregon. Sewers were tested and studies concluded that higher levels of ecstasy and cocaine were found in larger cities than smaller ones. This new type of research has also highlighted the various amounts of substances in water that are not filtered out and are being recycled and re-ingested by the general population. Although water treatment facilities do rigorous testing to determine the safety and quality of water, people can still consume a variety of unknown substances. This can cause a multitude of health issues. Drug use has steadily inclined over the past few decades. 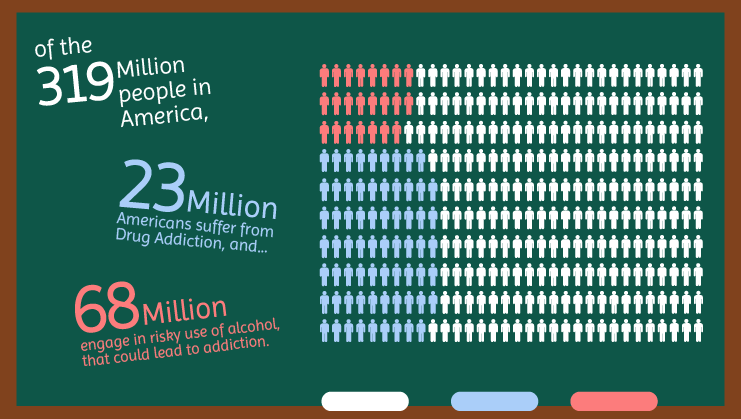 Approximately 23 million people in the United States are addicted to drugs or alcohol. These disturbing numbers create a call to action to address addiction and allow addicts to receive the proper treatment so that they can obtain sobriety. In order to combat substance abuse, President Barack Obama and The White House have created a policy that will aid in decreasing addiction across the country. President Obama, along with newly appointed Drug Czar Michael Botticelli, have devised a campaign that will aid those who are struggling with addiction. Botticelli, being a recovered addict himself, sheds a unique insight on the plan, since he has dealt first hand with the disease. The White House reported that Botticelli is spearheading a policy to aid those struggling with substance abuse by having resources available for them to use and achieve sobriety. Botticelli is promoting that addiction is a disease and education on this issue is important when combating it. Through education, one of Botticelli’s main goals is to prevent addiction. By making the youth, as well as adults, knowledgeable about traumatic events or life experiences that have aided in a person abusing a substance, citizens can prevent drug abuse. Botticelli also states that more addiction care facilities are needed for addicts to receive treatment. Now with President Obama’s Affordable Care Act (ACA) instated, more citizens have access to treatment facilities.This provides them with the education and tools to cope with substance abuse. He also states that it is important to support these individuals and aid them with the treatment process. Research, such as sewage epidemiology, is being conducted to better protect the American citizens from addiction. By understanding usage patterns by geographic location, the government can better tailor its prevention plan. Those dealing with substance abuse can also learn about treatment options and how to achieve sobriety. Seaside Palm Beach is an all-inclusive, luxury treatment facility. Our state-of-the-art rehabilitation center offers a wide range of specialized programs. For over two decades, we have offered our patients a comprehensive, holistic approach to treatment. With proven, high success rates we understand which programs best suit each individual. We also understand how important it is that a patient can continue to work during rehabilitation. Due to this we allow laptops and cell phones during treatment to continue to allows patients to remain connected. For more information about Seaside Palm Beach and how we can aid you in achieving sobriety, please call (888) 997-3274.